So you haven't blown it yet, but you're about to with the most important girl(s) in your life. Valentine's Day is tomorrow and you've forgotten to plan a romantic surprise. Or maybe it's completely slipped your mind that your BFF going through a rough break-up could use some cheering up, or your girlfriends or colleagues might appreciate a small token. If any of these scenarios apply to you, take these gift suggestions to heart. 1. Aveda Valentine's Day stress-fix gift set ($80 at Aveda salons). Aromatherapy oil, bath salts, and body lotions come packaged along with massage and relaxation tips. Perfect for a single gal or a couple looking to enjoy a relaxing evening at home. 2. Kate Spade Holly Street Jeanne bag ($428). A practical design and a pretty coral hue make this bag a winner. 3. Tassimo T55 Home Brewing System in red ($138 at Staples). A great gift idea for those who suspect their significant others love them and coffee equally. 5. Foe and Dear earrings ($60 at Cavalier). 14k rose gold and a simple design equal wear-all-the-time studs. 6. Kate Spade 'Emma' spiral notebook ($14 at Chapters Indigo). A notebook this adorable will surely be appreciated, even if the gift recipient is more likely to scribble to-do lists in its pages rather than a masterpiece to rival one of Austen's. 7. and 8. Essence Kalinka Beauty purse and duo lip cream ($3.99 and $2.99 at Shoppers Drug Mart). 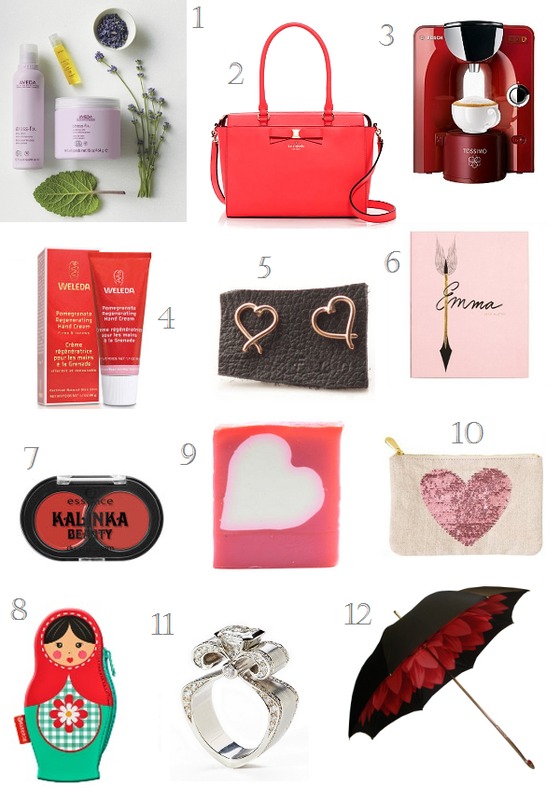 For a few dollars more than a greeting card, you can get your girlfriends matryoshka coin purses and mini lipstick palettes. (The texture and pigment level of the glossy and matte shades are similar to that of a balm stain.) Score! 9. LUSH neon heart soap ($6.95 per 100 grams). Like most of LUSH's products, this soap combines natural ingredients (passion fruit juice and soya yogurt) with an irresistible scent (citrusy bergamot, rosewood, spicy cinnamon leaf oil). But what really sold me is the bright neon colour and white heart on the inside. 10. Heart sequin pouch ($14.50 at Chapters Indigo). When I see stuff like this, I just want to throw my hands up and shout, "Go ahead, Chapters Indigo! Take all my money!" 11. Something from Stittgen Fine Jewelry. Order a custom creation for a loved one from one of West Van's best kept secrets. Obviously, custom work can't be done overnight, so the trick to pulling this off as a last-minute present is to surprise her with a romantic brunch, followed by an appointment with Stittgen's master goldsmith. 12. Pasotti black and red dahlia umbrella ($195 at Raindrops). So you can pull off the "romantic walk in the rain" cliché with panache. Can that Kate Spade bag be any cuter? They do wonderful things with bows over at Kate Spade. Well bit late to discover your advices but i could prefer to buy red bag or jewellery for Valentine's gift. There's always birthdays and anniversaries.